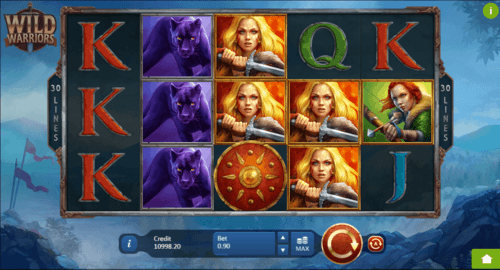 Wild Warriors is a 5 reel, 30 payline slot game with a 94.6% RTP. This UK Online Slot comes with Free Spins, Scatter Symbols and Wild features.7 or more scatter symbols trigger Free Spins. Produced by Playson this online slots is all about feminine power. Women can not only take on the role of housewives but they can also do all other tasks which men do such as being brave warriors. This slot creates an imaginary fantasy world with its own rugged terrain. It is in this world where four warrior sisters reside. These sisters work together and fight as a band to ward off evil and oppression from their lands. They have got some amazing fighting skills and techniques which they use to stay strong and in shape. You will be travelling with the 3 sisters in this slot on your adventures. Don’t worry you are in safe hands in this slot because these four are not just sheer beauties but they are also termed as the wildest warriors of this world. They will turn into wild lionesses who will ravage and tear apart their enemies. So rest assure that your adventures will be safe and in good company. Do keep searching for precious items on the way here and there on your adventures. Try not to be distracted by the beauty of these apparently innocent looking ladies because your top priority should be your wins and your pocket which you can full to the maximum in presence of your warrior friends. You can try your luck in this big adventure on Money Reels where the portal to this amazing world has been opened. This slot has an amazing RTP of 94.60% with 5 reels and 30 Betways. The coin value in this slot is a variable and can be changed between 0.3 – 90. For the first you will realize the feminine power that can truly change destinies and ward evil off. Feel free to collect rewards and items in this slot because you will be in very safe company and secure hands. The four sisters will be around to protect you and to help you in making some nice and exciting wins. The gameplay of this slot is built around a fantasy world where people are struggling to survive in the tough conditions. Life has been very tough for the people in this fantasy created world. To make the matters worse the harsh weather has also arrived which is making it even more difficult to survive. It is in these tough conditions that the four sisters have become accustomed to the hardships of this world and become literally women of steel who will stop at nothing when they want to achieve something. The developers have been very accurate and crisp in creating a harsh environment for the slot. It will give the player an idea of the rough and tough conditions of this fantasy world. This slot has a genre of Fantasy and Action. The background of the slot shows the harsh terrain of this world. There are rugged mountains, lots of mist and a very chilling type of weather in this slot. It is in this dangerous terrain that the people struggle to survive and at the same time face their enemies such as the weather and the evil oppressors. Weather is not the only killer in the slot, there are a lot of evil forces at work as well that try to supress the human population by different evil designs but thanks to the four sisters that evil is always kept in check. The slot box nicely suits the fantasy theme of this slot and is covered in a light brown metallic border. The number of lines are shown on both sides of the slot box. The colour of the reels is opaque and has a dark themed colour which adds the effect of cold weather on the screen. Symbols that are used in this slot are the lower valued and the higher valued symbols. Lower valued slots are represented by alphabets like J, K, Q and A. The upper valued symbols are represented by the red haired, the blonde haired, the brown haired, the plum haired lady warrior and the black jaguar. The symbols that add some more symbols to this game are the scatter symbol and the wild symbol. The wild symbol depicted by the wild logo will substitute all symbols for the player to help him form some extra wins. The sisters will make sure that you get something in your pocket. The scatter symbol depicted by the shield will trigger the bonus features for you and will make your gameplay experience even more fun. The adventure can get tiring at times and may exhaust you. To refresh yourself just turn on the autoplay and watch the reels spin in a refreshing automatic manner. Playson is a top notch developer of slot games which uses latest techniques and innovative ideas to produce the best quality slot games based on different fun themes. Other similar games from Playson include Fruits and Jokers slot, Happy Jungle, Space Lights and Taiga UK slot game etc. The Sisters will be giving you an adventure with lots of action and thrill filled moments. Don’t lose your pace and try to keep up with them in this journey. Their company can be very entertaining and at the same time a fun filled experience. The rewards that lie in wait for you are directly proportional to the dangers that you will face. This slot offers the following bonus features for the players. The scatter symbol is represented by the shield and if it lands in at least 7x numbers or more, it will trigger the free spins. For 7,8 or 9 free spins the player will be rewarded with 8,12 and 25 free spins respectively. Be on the lookout for the scatter symbols because they will turn out to be the fortune changers for you. During the free spins the red haired lady with the bow will appear as a colossal symbol. It is a giant symbol of 2x2 or 3x3 which will increase your chances of winning exponentially.